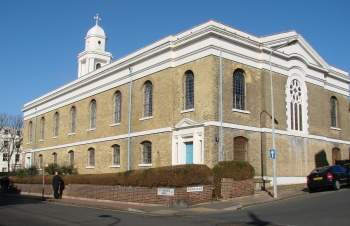 Built as a proprietary chapel by Thomas Read Kemp in 1824-25 for his new development of Kemp Town, the architects were C A Busby and A H Wilds (VCH 7 p261). 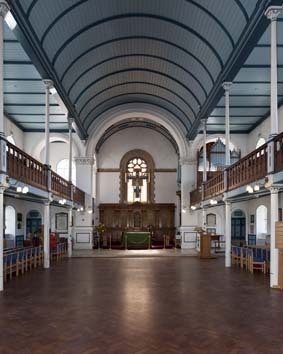 Kemp became financially overstretched and sold it about 1830 to Lawrence Peel, son of Sir Robert Peel, whose family owned it until the congregation bought it for £4000 in 1889 (Dale p45) and it became a parish church. The chapel was a late example of the type that goes back to James Gibbs and even Christopher Wren. Thus, its plan as originally designed was a plain rectangle with a west tower built within the rectangle and it is wholly classical in style, albeit Grecian rather than Italianate. 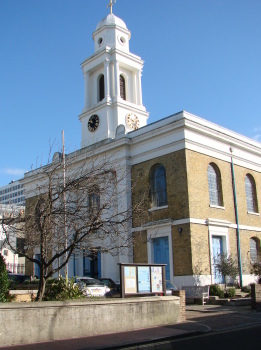 Built of yellow brick, it recalls the contemporary Commissioners’ Churches in London and elsewhere. The slightly recessed centre of the west front is flanked by Ionic columns in which, unexpectedly for the period, winged cherubs are set. The tower has paired Doric columns at each corner and a domed top. Because of the galleries inside, the sides have two tiers of windows. Inside, the upper west gallery with a bowed front is approached by gracefully curved stairs. It was added in the 1830s within the space of one week by T Cubitt (1). 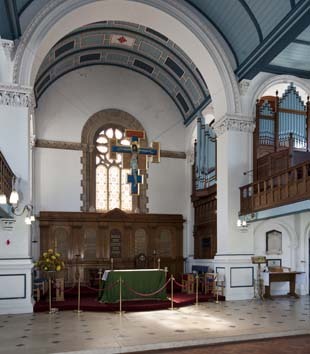 The urgency arose because of the surge in popularity occasioned by the decision of Queen Adelaide to make St George’s her chapel royal when visiting Brighton (ibid). Though the interior retains an early C19 air, there were considerable alterations in 1890. This is the date of the thin iron piers with acanthus capitals above the galleries, which replaced Doric columns. The pretty balustraded fronts of the lower galleries and the pews are of the same date (1), when in addition the arched plaster roof was boarded and a short sanctuary with a coffered roof was added. This is not immediately apparent from outside since the sides are concealed by extensions of the side-walls of the existing church (that to the south houses the organ). The big east window has vaguely Venetian tracery. 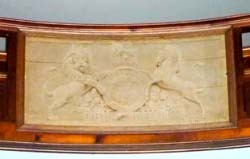 The architect of this work is not known for certain, but it has been given to Sir A W Blomfield. In the light of his known alterations to the similarly classical St Stephen Montpelier Road the following year, the attribution is plausible. Further repairs in 1967 (ESRO Par 265) by J L Denman and Son were unobtrusive. 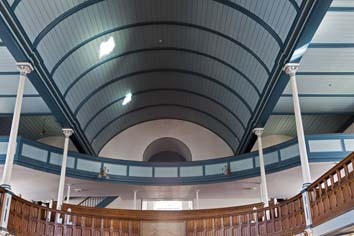 There were alterations in 1998-99 to allow concerts to take place (Elleray (2004) p7) and the lower west gallery has been fitted out as a chapel. Font: Plain octagonal, dating probably from 1890. Memorial: William King (1864?) by W R Pepper junior (Roscoe p970). 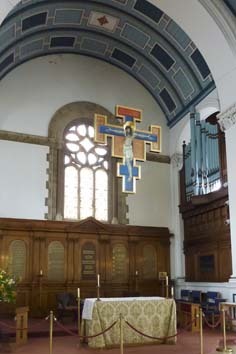 Reredos: Early C19 in pattern, with pilasters and a triangular pediment above the central part. It displays the Lord’s Prayer, Creed and Commandments. In fact it dates from 1890 and shows the evangelical preferences of the new parish. Rood: Painted crucifix that is influenced by mediaeval Tuscan ones. Royal Arms: On gallery front and made of cast stone, possibly Coade stone. My thanks to Nick Wiseman for the photographs of the interior and fittings.